One of my favourite things about natural and organic beauty is supporting smaller, artisan businesses. LJ's Natural Solutions is a Cheshire-based brand created by aromatherapist Lisa Johnson, who decided to start making her own products as she suffered with severe eczema and sensitive skin. There are various skincare products in the range, all priced very reasonably considering the high quality of natural ingredients used. Lisa kindly sent me some samples* to try a few weeks ago and I've really enjoyed my first experience of these products! There were two stand-out favourites of the bunch for me; the first was the Organic Deep Cleansing Balm. It has the perfect smooth balm consistency with a subtle relaxing scent which is lovely for an evening cleanse. 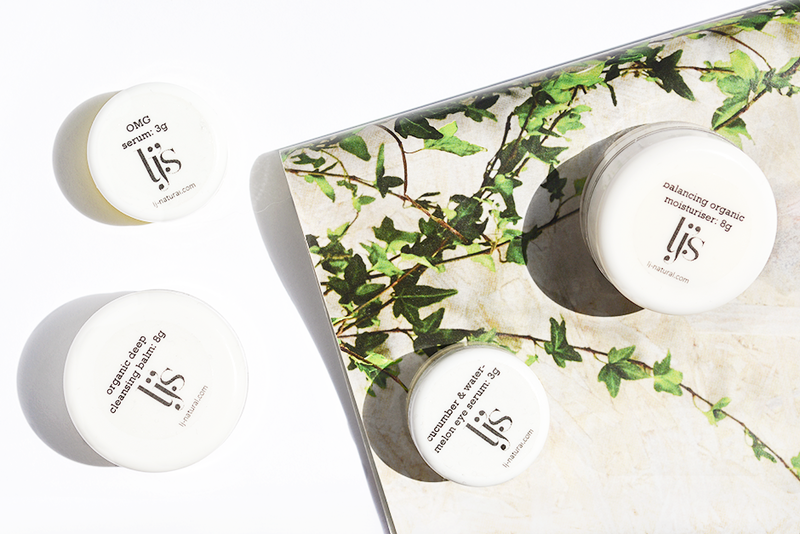 It melts away makeup just as well as my favourite balms and leaves the skin feeling smooth and hydrated. I would definitely consider buying the full size in future when I run out of my current cleansers! You can choose between a glass jar or airless pump packaging which is great depending on your personal preference. I also loved using the Balancing Organic Face Moisturiser in the daytime. This has to be one of the best balancing products I've tried - my skin was so balanced over the couple of weeks of daily use, both clearing up any dry patches and also keeping my t-zone completely shine free throughout most of the day. It's such a nice base to use before applying makeup and overall has appeared to improve the texture of my skin too. I think it's great value as well, priced at £9.95 for 50g. I wasn't quite so enthusiastic about the other two products as I felt like they were a little too hydrating for my skin right now, but I think they'd be ideal in the winter and for drier, mature skin. Both these serums have what I would describe as a gel-like consistency and you only need to use a small amount to get the job done! The OMG (Organic Miracle Goodness) Serum is particularly rich and hydrating on the skin and is also said to have a plumping effect. The Cucumber & Watermelon Eye Serum is very gentle as it's free from essential oils and it absorbs easily. I found it refreshing to use and noticed a slight reduction in puffiness too. LJ's Natural Solutions have made a great first impression and I can see myself purchasing the cleansing balm and moisturiser in the future when I next need to stock up! If you have sensitive skin, eczema, or just love effective, high quality products at an affordable price, this is definitely a brand you need to try! You can explore the rest of the range at lj-natural.com. Have you tried any products from LJ's Natural Solutions before? I'd love to try LJ's Natural Solutions! Their products sound lovely. I've tried the OMG serum (in the winter) and it is lovely, such a rich, moisturising serum. I'd be keen to try out more though as I was really impressed with the sample I had. I bought the samples you tried and after using them for a while I decided to buy a full size version of their eye serum and OMG serum. I found OMG serum really helped my breakout prone skin to look better especially when my skin looked in a really bad state - it helped to reduce the redness and the size of spots which is the main reason why I decided to buy a full version. I use it only in the evening and when I wake up in the morning my skin feels nice and soft, any breakouts from the previous day visibly reduced. The eye serum is one of the best 100% natural eye serums I tried. I'm from Cheshire but haven't heard of these products before they sound great for people with really sensitive skin. I'll be sure to recommend these to my friends who suffer from eczema.